Microtubules, hollow fibers of tubulin protein only a few nanometers in diameter, form the cytoskeletons of living cells and play a crucial role in cell division (mitosis) through their ability to undergo rapid growth and shrinkage, a property called “dynamic instability.” Through a combination of high-resolution cryo-electron microscopy (cryo-EM) and a unique methodology for image analysis, a team of researchers with Berkeley Lab and the University of California (UC) Berkeley has produced an atomic view of microtubules that enabled them to identify the crucial role played by a family of end-binding (EB) proteins in regulating microtubule dynamic instability. During mitosis, microtubules disassemble and reform into spindles that are used by the dividing cell to move chromosomes. For chromosome migration to occur, the microtubules attached to them must disassemble, carrying the chromosomes in the process. The dynamic instability that makes it possible for microtubules to transition from a rigid polymerized or “assembled” nucleotide state to a flexible depolymerized or “disassembled” nucleotide state is driven by guanosine triphosphate (GTP) hydrolysis in the microtubule lattice. “Our study shows how EB proteins can either facilitate microtubule assembly by binding to sub-units of the microtubule, essentially holding them together, or else cause a microtubule to disassemble by promoting GTP hydrolysis that destabilizes the microtubule lattice,” says Eva Nogales, a biophysicist with Berkeley Lab’s Life Sciences Division who led this research. Nogales, who is also a professor of biophysics and structural biology at UC Berkeley and investigator with the Howard Hughes Medical Institute, is a leading authority on the structure and dynamics of microtubules. 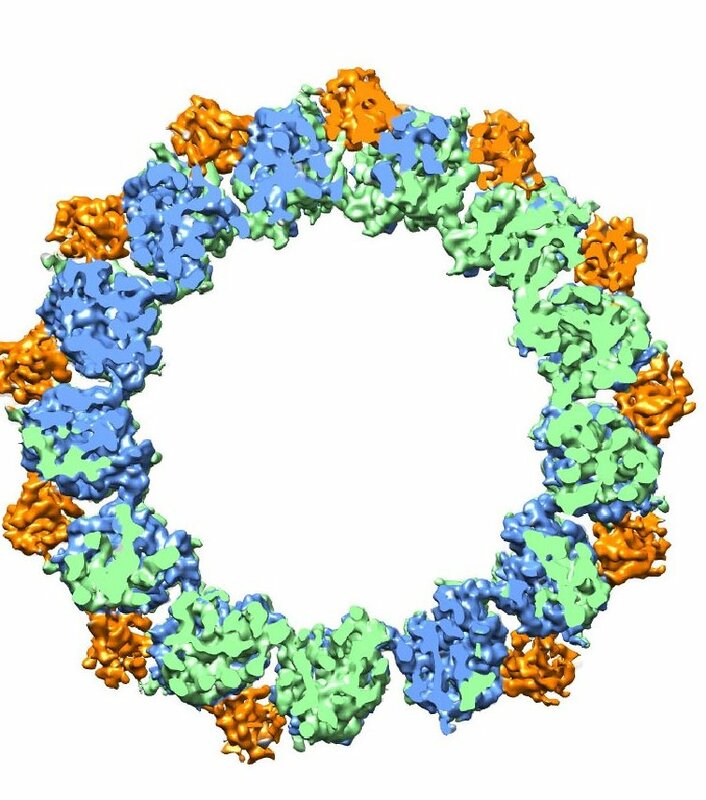 In this latest study, she and her group used cryo-EM, in which protein samples are flash-frozen at liquid nitrogen temperatures to preserve their natural structure, to determine microtubule structures in different nucleotide states with and without EB3. With cryo-EM and their image analysis methodology, they achieved a resolution of 3.5 Angstroms, a record for microtubules. For perspective, the diameter of a hydrogen atom is about 1.0 Angstroms. “We can now study the atomic details of microtubule polymerization and depolymerization to develop a complete description of microtubule dynamics,” Nogales says. Beyond their importance to our understanding of basic cell biology, microtubules are a major target for anticancer drugs, such as Taxol, which can prevent the transition from growing to shrinking nucleotide states or vice versa. “A better understanding of how microtubule dynamic instability is regulated could open new opportunities for improving the potency and selectivity of existing anti-cancer drugs, as well as facilitate the development of novel agents,” Nogales says.